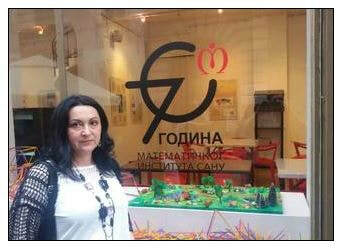 Our partner Marilena Faiciuc from Romania, with her students won the first prize on the National Contest "Made in Europe". They made a brochure about our eTwinning project "Math In Practical Life." 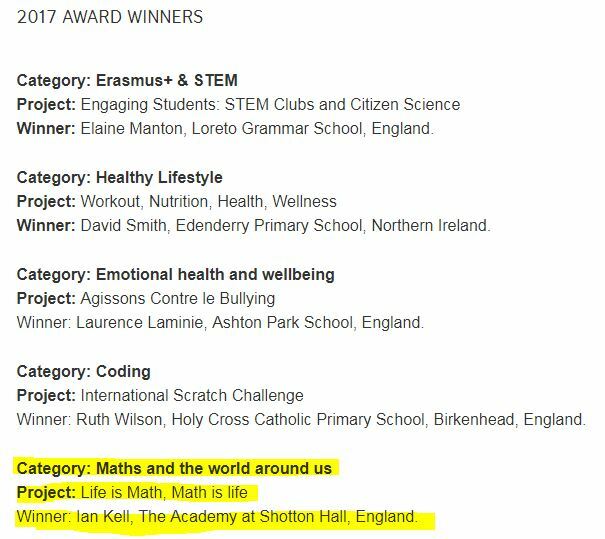 ​On the 2016 ANNUAL NATIONAL AWARDS AND CONFERENCE in UK, held in Nottingham from 24-26 June 2016,our project "Math in practical life" was in a category "Highly commended STEM project​"
The part of the International Conference of educators, teachers, professional associates and directors of educational institutions organized by the Regional Center for Professional Development of Education in Čačak (28.11.2015). Jelena Kenić presented our project "Math In Practical Life" in front of over 200 participants from kindergartens, primary and secondary schools. Part of The Second eTwinning Conference held on 02.12.2015. in Belgrade. "LIFE IS MATH, MATH IS LIFE"
We decided to continue our idea and a great cooperation so we have started a new eTwinning project "Life Is Math, Math Is Life"
Within the manifestation "May, Month of Mathematics", at this year's contest "The face of mathematics", I was elected to be one of the ten teachers who presented their work and examples of good practice. I sent an electronic book and links to the websites of our two eTwinning projects. I called this work "With the mathematics through the Europe". My objective, apart from popularizing mathematics, was to show to the general public all the beauty and possibilities of eTwinning network. 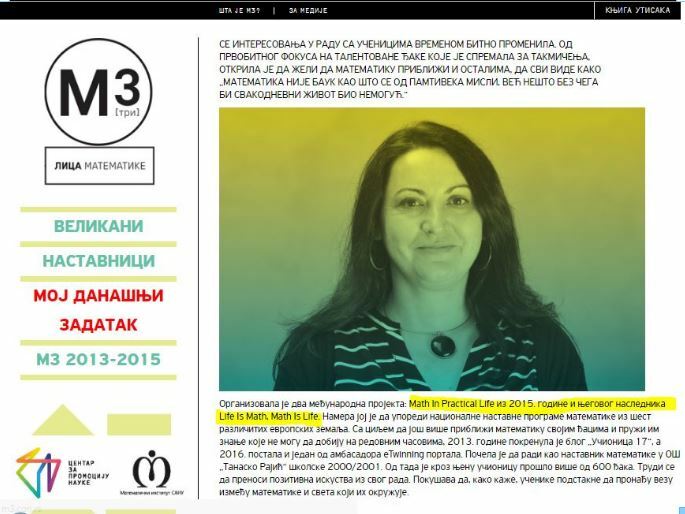 My picture and description of my work were exhibited in the lobby of the Faculty of Mathematics in Belgrade, in the scientific clubs around Serbia as well as in the public transportation vehicles. On May 27, I held a presentation on this topic in the Gallery of Science and Electronics SANU (Serbian Academy of Sciences and Arts) for students from one elementary school in Belgrade and their teachers. 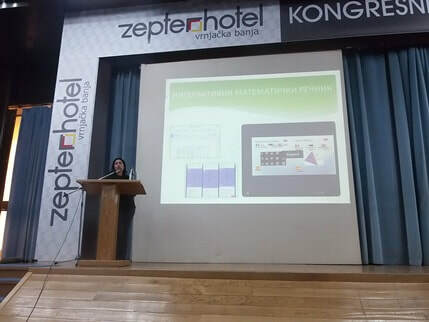 On a training for educators "MAke science Real in Schools - MA.R.CH", I presented our projects in front of the twenty fellow teachers as an example of the good practice. I tried to present all positive changes that the eTwinning projects brought into my classroom. 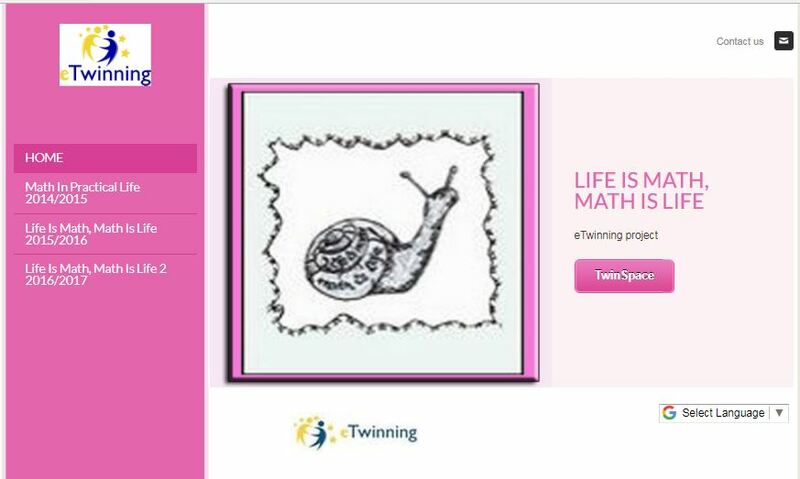 On the first webinar, a part of the first common online module "eTwinning projects without borders", organized for about 100 eTwinners from Croatia, Serbia and BIH, I presented our project "Life Is Math, Math Is Life" as an example of the good practice. My main idea was to inspire other teachers and to show them a good way to implement eTwinning into the regular classes. 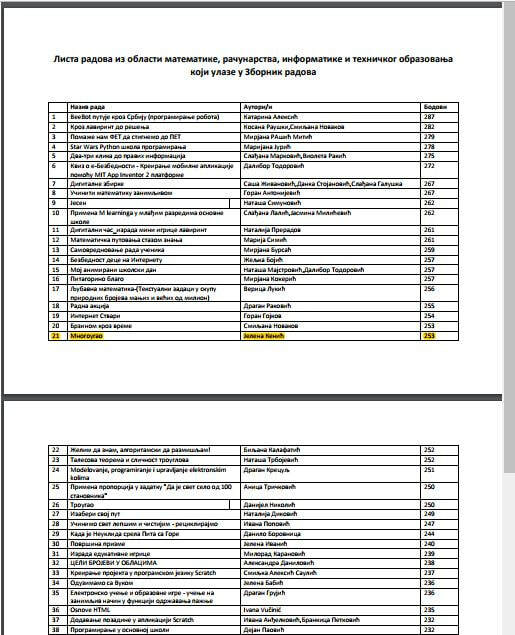 On the Serbian annual National Competition "Digital Hour" organized by The Ministry of Trade and Telecommunications, the work made by Jelena Kenić was elected for the Collection of the best digital lessions in 2016/2017. This work describes how we integrated our eTwinning project into the regular classes of maths, in fact, how we prepared a presentation about polygons. 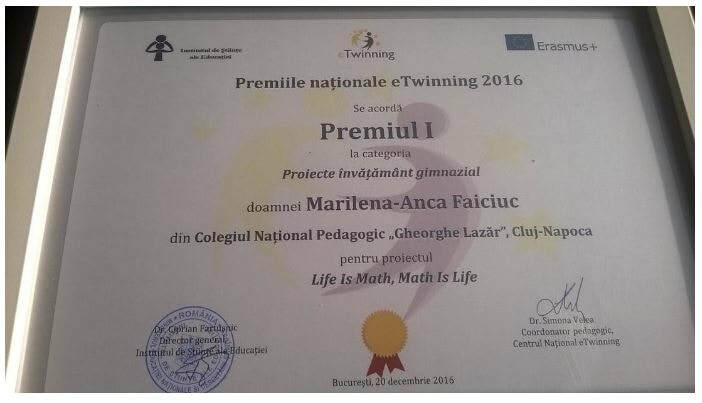 On December 20, 2016 at Romanian National Prize Contest for the best Project from Secondary Education, teachers Marilena Faiciuc and Daniela Titovenau won the First prize with our eTwinning project "Life Is Math, Math Is Life". ‘New Technologies in Education’ is the international conference and fair, held in Belgrade and organised by the British Council with the aim to improve the quality of education in this part of the world through the use of information and communication technologies. 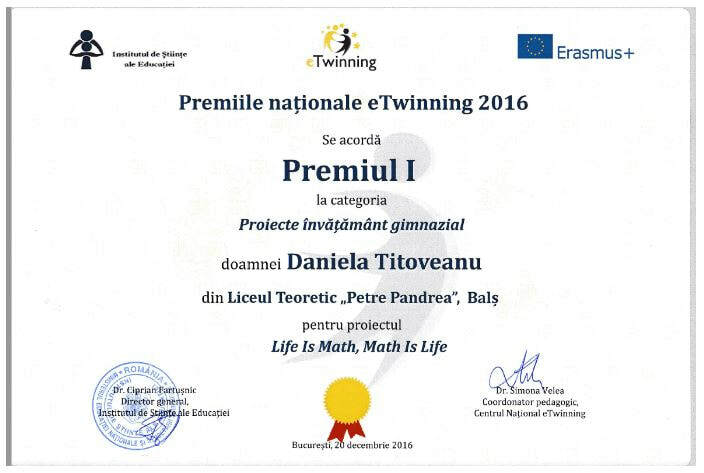 On the first day, February 9th, I presented our eTwinning project 'Life Is Math, Math Is Life'. In the primary school "Dr.Dragiša Mišović" in Čačak, on March 30 2017, I held a workshop on the topic "eTwinning - Initial Steps", where I presented the eTwinning portal, the possibilities it provides - from finding future partners, the beginning of mutual cooperation and the implementation of joint projects, to personal and professional development. 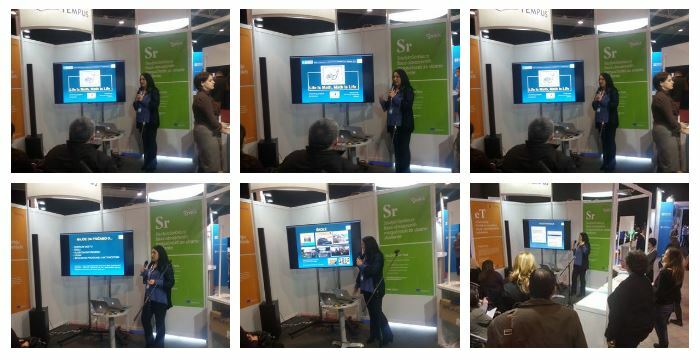 As the example of the good practice, I presented our work on a series of our projects. 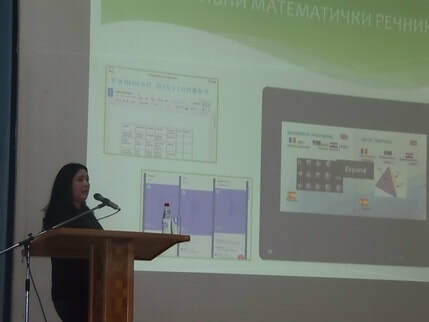 In May 2017, at the third event "NiMat" (Festival of Mathematics in Niš), through the Skype, I presented our eTwinning projects and showed how we successfully processed some mathematical topics in this way. 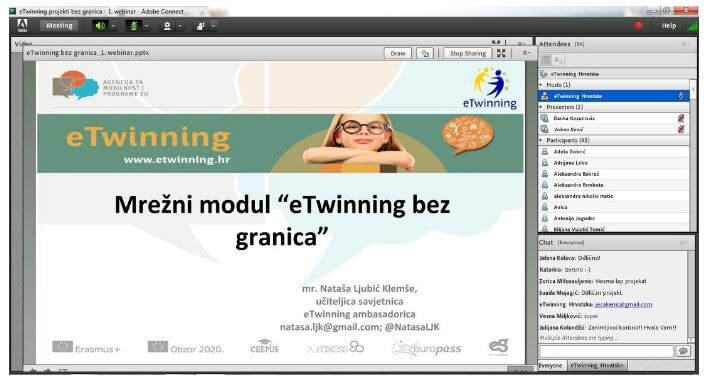 Invited by the eTwinning National Support Service of Serbia, as an eTwinning ambassador, I held one of the webinars. A part of the presentation, as an example of good practice, I presented how we managed to implement our eTwinning projects into the curiculum of maths. 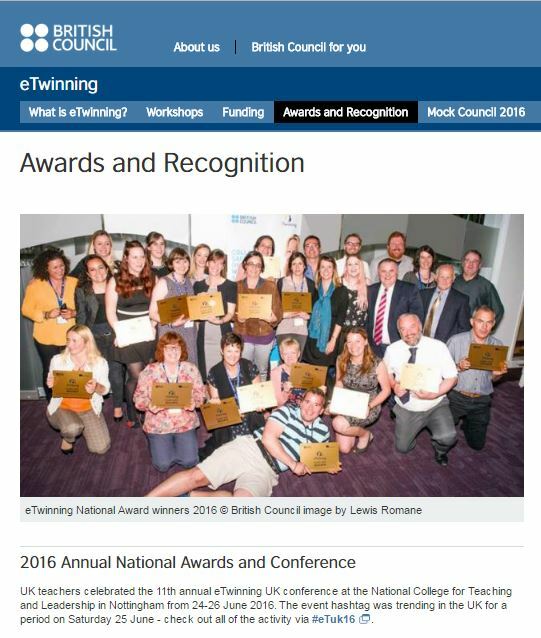 Teachers from across all four regions of the UK came together from Friday 9 June until Sunday 11 June 2017 to celebrate the 12th annual British Council eTwinning UK conference at the Jubilee Conference Centre (formerly the National College for Teaching and Leadership) in Nottingham. The event hashtag #eTuk17 was trending second in the UK throughout the weekend, with over half a million Twitter impressions made. 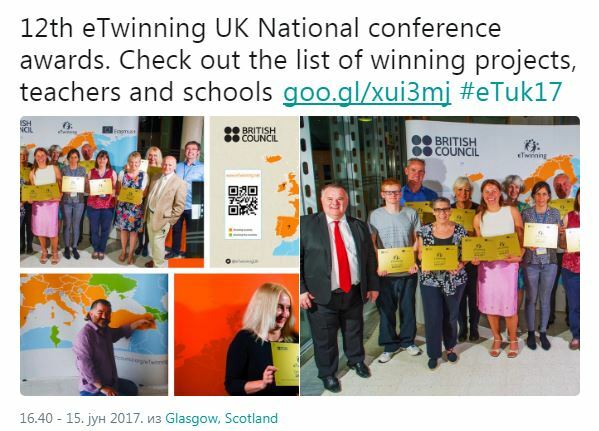 The overall theme of the conference was eTwinning and inclusion – tackling learning barriers for all, focusing on issues of equality, equity, diversity and inclusion in UK schools. 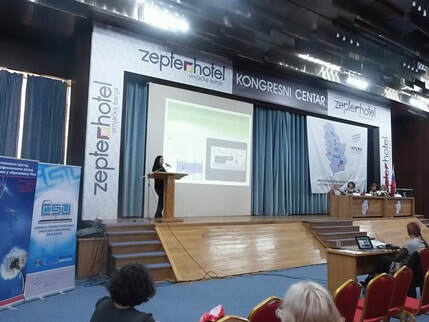 CONFERENCE "Responsibility of Directors in the Educational System of the Republic of Serbia"
The Conference "Responsibility of Directors in the Educational System of the Republic of Serbia" was held at the hotel "Zeppter" in Vrnjacka Banja on October 16 and October 17, 2017, and it was organized by the Network of Regional Centers and Centers for the Professional Development of Serbia. 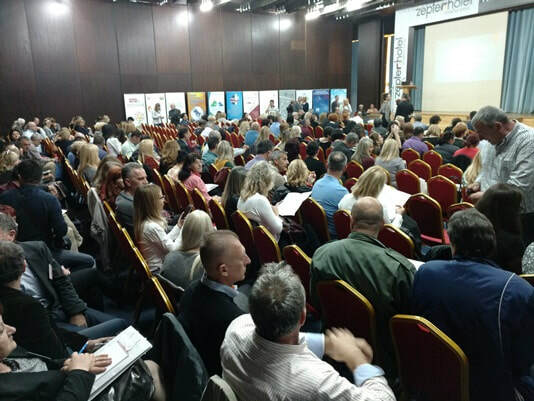 About 400 participants - school principals from all over Serbia had the opportunity to get a handful of important information from the most competent people of the education system in Serbia during these two days. During the second day, as an eTwinning and Erasmus + ambassador, I held a presentation "With the Projects through the Europe". I tried to show in the most picturesic way, with a series of examples of good practice all the positive changes that our eTwinning projects brought to my classroom. As a part of the presentation, I briefly gave attention to the eTwinning portal highlighting its security and the possibility of professional development.